When I’ve got a few blemishes, or want to give skin a deep cleanse, there are a couple of products from Soap and Glory that I will always reach for. There are a couple of products in the range which I love, firstly The Fab Pore 2-in-1 Facial Mask and Peel (the round pot) and No Clogs Allowed Super Self Healing Deep Pore Detox Mask*. No Clogs Allowed is a self heating deep pore detox mask – if you’ve never used a self heating mask before then prepare to be amazed! It blows my mind, every time. Soap & Glory say that the face mask helps to prevent breakouts and blemishes by deep cleaning your pores. One of the ingredients is Glycerin which I’ve been noticing a lot recently, it keeps soil feeling soft and supple. The mask is formulated for oily to combination skin, but i’ve read reviews that it works on dry skin too, but I’d have a moisturiser to hand afterwards! It says to shake before use which I found a little odd for a face mask, but make sure you do! Otherwise it comes out all separated and I may or may not have spilt some on the carpet… You massage onto your face, wet your hands and then scrub until you are blue in the face – literally! That’s when you will really feel the self heating. The result? My skin feels cleaner and tighter afterwards, and some blemishes that were threatening to surface seem to have cooled off which is a relief! I’d say for a relatively inexpensive product you feel like you’ve had a deep pamper and there’s enough in the tube for up to about 10 applications so it’s very good value. The second product, The Fab Pore is even more pampering – the minty green mask also has a refreshing fragrance – almost Mojito like! Opposite to No Clogs Allowed, the mask deiverd a cooling and calming sensation when applied which I prefer on the warmer evenings like we have been experiencing recently! Soap & Glory say you can leave on for 5 mins for ‘a quick refresher’ or 15 for an extra clean. The first time I tried it for 5 minutes I felt nicely pampered but it didn’t really budge my blackheads, so the next time I tried for the full 15 minutes and was pleased to see some squeaky clean pores when I washed it off! I think you would have to use this mask quite regularly if you wanted to remove every single blackhead but the ease of this mask and it’s refreshing sensation means i’ll be picking it up a lot more over the summer! 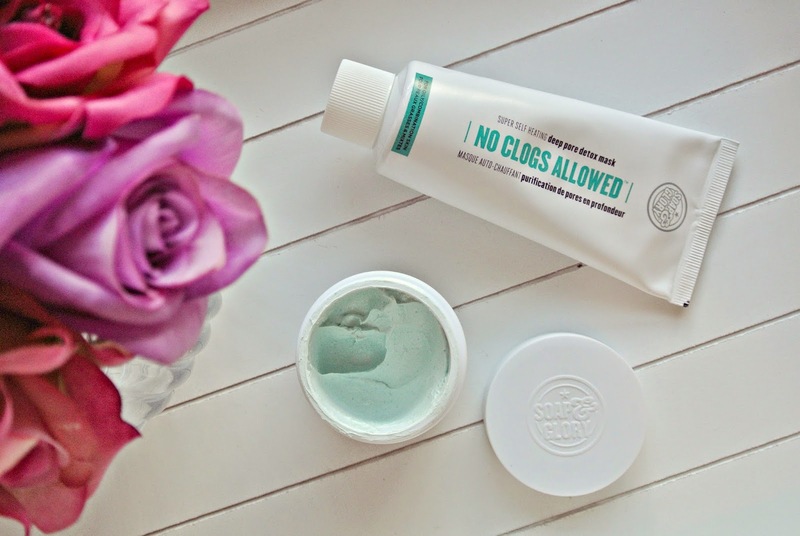 Sorry for the essay – I hope I may have helped you decide which Face Mask is right for you, both are available from Boots – No Clogs Allowed is currently on SALE for £7.67, it’s usually £11.50 (click here!) and The Fab Pore is £6.67 down from £10 (here), so stock up now!